Shimano officially announced the long-anticipated release of a new 11-speed XTR mountain bike component group today in both Race and Trail tuned versions. The new XTR M9000 component group includes options for 1x, 2x and 3x front chainring combinations, a new cassette, brakes, front and rear derailleur, shifters, a chain, pedals and wheelsets. The new, mountain-specific 11-speed cassette is available in a single configuration Shimano calls a “rhythm step” progression of 11-13-15-17-19-21-24-27-31-35-40 tooth cogs. Depending on the size, the cogs are crafted from aluminum, titanium or steel and employ a carbon fiber gear carrier. Unlike the company’s 11-speed road cassettes, the mountain 11-speed works on existing Shimano 10-speed cassette bodies. Shimano is putting a lot of faith in people wrapping their heads around the rhythm step concept, which essentially refers to selecting tooth counts that result in smooth groupings of gears within so-called power bands of pedaling cadence and effort that are about 30 rpms wide. Some of the gears work well for smooth pedaling—“driving gears” as Shimano calls them—while others make good climbing gears, either for steep pitches or technical ascents. Complicit in making the system work are the front chainring tooth counts which have significantly changed from prior 2x and 3x versions to create adjacent and accessible gears within these usage bands. And while the math pencils out—and we think the logic of it will likely become intuitive on the trail—it does seem to bias the use of a front derailleur system over a 1x option. 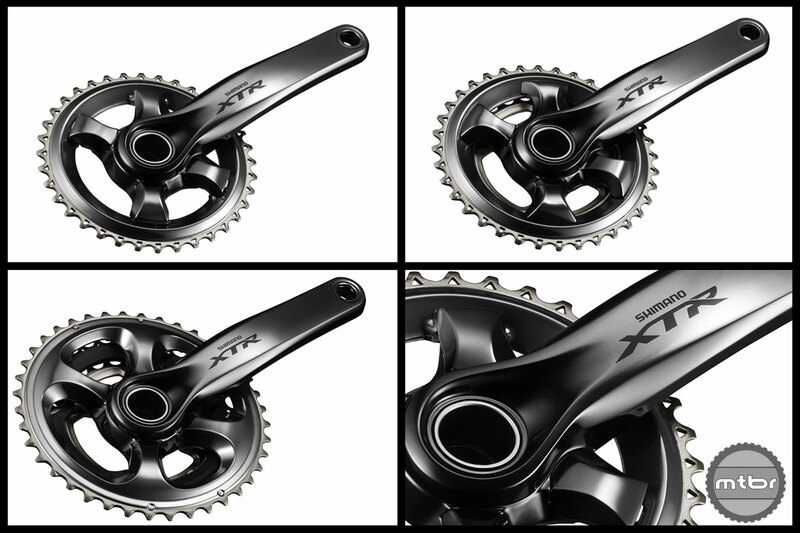 Shimano’s new crankset is modular and designed to accommodate 1x, 2x or 3x chainring configurations interchangeably. Essentially, you can go back-and-forth between the chainring configurations without buying new crank arms, though, obviously, shifter, derailleur and possibly chain changes are necessary. Their long-awaited 1x option comes with 30-, 32-, 34- or 36-teeth, but unlike rival SRAM and other aftermarket manufacturers it does not use a narrow/wide tooth configuration. Instead, Shimano has opted for a new tooth profile that is uniformly wider and taller than on previous chainrings, and has a slightly hooked leading edge. The company claims the profile—when used with its Shadow Plus clutch derailleur—is at least as good as narrow/wide in terms of chain retention in rough terrain. In an effort to make a more useable combination of gears, Shimano has changed their 2x and 3x tooth counts to better work with the rhythm step gearing. 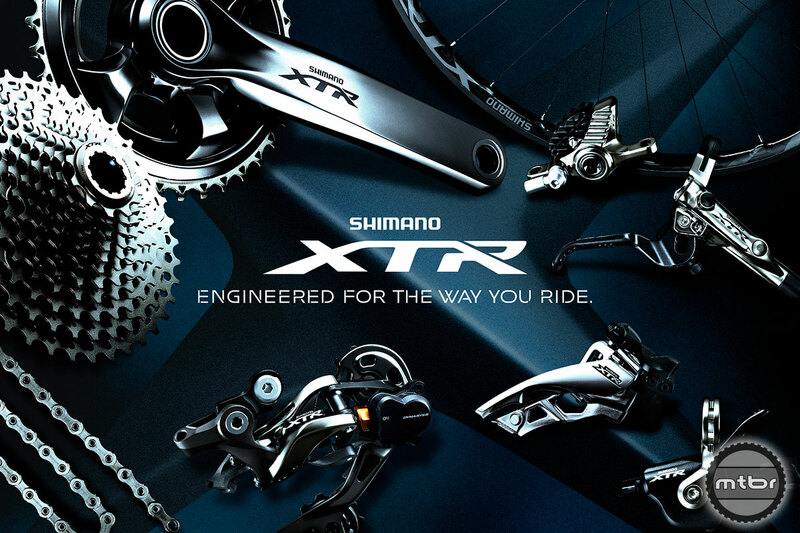 XTR trail uses a 36/26t combo, while XTR Race goes with 38/28t—a departure from the wider spreads of old. Shimano says the 10-tooth jumps makes for better front shifting as well as a more logical spread of gearing ratios. In 3x, Shimano goes to a 40/30/22t from a 42/32/24t combo on the old M985 set. Combining metals and carbon fiber ranks highly on the competency scale for Shimano and perhaps nowhere is it more advanced than on the company’s high-end HollowGlide chainrings which combine long-wearing titanium teeth with a lightweight carbon fiber and alloy structure. The new chainrings mate only with the new XTR FC-M9000 Race and XTR FC-M9020 Trail Hollowtech II crank arms which have revised bolt patterns Shimano says makes for stiffer interface and more efficient power transfer. This also means old chainrings don’t work with the new crankset and vice-versa. The Race and Trail cranksets are each tuned to their specific usage with the former being lighter and stiffer, and the latter spec’d to be a bit tougher. The Race version sports a narrow 158mm Q-factor and uses a 3D hollow bonded structure on the non-drive arm while the Trail cranks are cold forged for greater durability and have a standard 168mm Q-factor. More gears necessitate a narrower chain and Shimano has introduced the CN-HG900-11 to handle the duties. The chain works in all XTR chainring configurations and features the company’s HG-X11 asymmetric plate design. This design, in combination with an impregnated surface coating on rollers and inner plates called SIL-TEC, conspires to keep the moving parts smoother operating, quieter and longer lasting, according to Shimano. So disappointing. I love Shimano brakes, but this is no answer to SRAM’s 10-42 1x setup. Why would I want to reduce my gear range? And no, now that I’ve been on xx1 for a year, I will never have a front derailleur on a mtb again. I loveLOVELove my XTR brakes, but I also LOVE my XX1 now, and I really do not care for a front der on my bigger bike. Don’t miss it, don’t want it. XX1/XO1 works well. And yes, the new crankset looks mad budget. I don’t have to buy a new hub or have a clunky after market set up to get a 40t…SOLD! I don’t see peoples problem with giving people options. If you don’t want a front derailleur, don’t use one, if somebody wants a 2 x 11, or 3 x 11, it’s their bike, they can do what they want. I’ll wait for the XT or even SLX version, but I’ll be glad to ditch all my Sram stuff. Shimano SLX 1 x 11 would be sweet. I love it – great gear spread on the back, and 30/40t up front is perfect. Now just need to provide a 20t option instead of 22t and I won’t have to put boutique aftermarket gear on my bike. Brakes look awesome. Definitely not psyched to have to buy new shifters, derailleurs, chains, and cassettes again, and have multiple bikes with incompatible drivetrains. Seems like much of the same thing could have been accomplished sticking with the 10 spd. But that wouldn’t sell new parts either. Oh I forgot about the 40t cog. No 20t needed even on a 29’er….sweet. Fantastic! I’ll be lining up for the XT version, when it’s released. 2 x 11 on my race bike, 1 x 11 on the big squishy bike, and done! Although, really, I’d be happy with a Shimano 11/40 cassette in ten speed. I’m running that now, courtesy of One Up and their perfect 16t “freebie” cog, and it is perfect. No big 36 to 42 shift (which is a fine jump on the trail bike, but not on my race bike). Exactly what I was thinking. 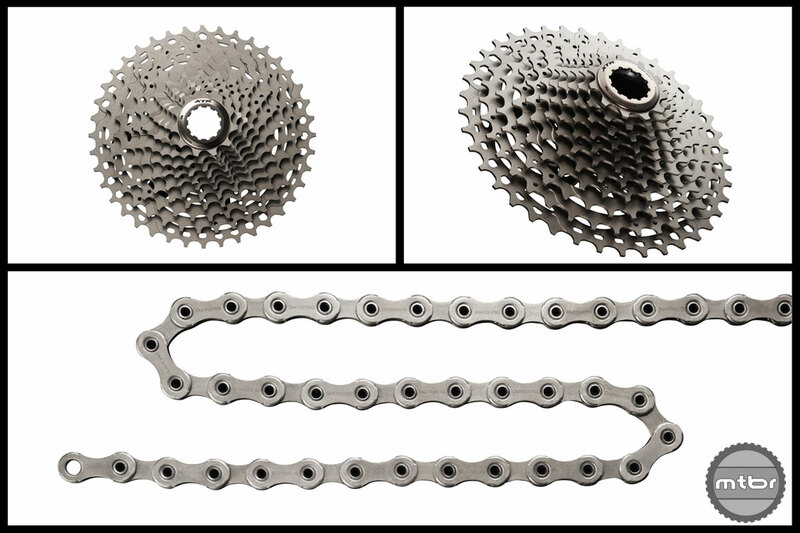 A 10-speed 11/40 or 12/42 cassette from Shimano or SRAM would have been a product announcement I could get excited about. the best part is that SHIMANO’s 11-40 gear design will TRICKLE DOWN easily to it’s cheaper GRUPPOS while SRAM’s XD design isn’t cost-effective enough for lower priced sets. oh… why hasn’t anybody mentioned this…. THEM CRANKS LOOK FUGLY!!!! I have XTR brakes on all my bikes, XX1 drivetrains on 2 of them and a CLUNKER aftermarket XT 1X with Wolftooth front and rear and works fantanstic, they are only junk to those who dont know how to turn a wrench. Love my XX1s but most likely will not buy another considering you can do it for about 150 bucks now. LOVE XTR stuff but probably wont pay the XTR price for 1X with all the options out there now. Ford or Chevy??? Both work great. They so missed the boat on gearing for 1x. It’s hard enough to get a good spread on SRAM 1×11 with 10-42, and they go with 11-40?? Then only offer down to a 30T front? Forget it for anyone who rides steep terrain on a 29er. This has the feel of a company that’s out of touch with mountain biking. Maybe they should focus on road for the drivetrain, become a brake only company for MTB. Why have so many cogs on rear? I almost have my 3*8 (34 – 11) and i could pass everywhere.